Most of us spend a lot of money in constructing a deck for our outdoor entertainment needs. A shade sail over your deck will give you the necessary protection from the hot sun and make it more enjoyable. You could have even a waterproof sail or structure so that you need not interrupt your enjoyment and rush inside your house when it rains. 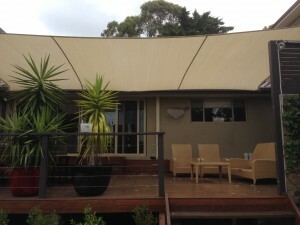 Sails also protect and enhance the life of your decking. Brilliant Shade Sails can design and install sails that are unique for your needs.